Regardless of usage and ampacity required, ERICO can provide the materials needed to connect a wide range of cable sizes to a variety of rail types. Our complete line of products includes not only CADWELD materials, but also all of the necessary equipment to make the best electrical connection possible. The CADWELD process provides an efficient field method for any electrical connection, from signal and power to grounding. ERICO’s unlimited design and manufacturing capabilities make it possible to provide the best weld for any connection requirement. 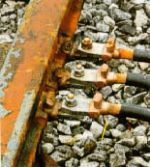 All electrical connections to rail and splicing contact rail should be welded with the CADWELD copper-based exothermic welding process as manufactured by ERICO.